London's Irish community heads to Trafalgar Square to celebrate their patron saint – and everyone's invited. The Irish are experts when it comes to partying. They’re so good, in fact, they even have a special untranslatable phrase – the craic – to describe their unique brand of conviviality. They manage to have a brilliant time in the most unpromising locations – your typical Irish church hall is gloomier than Eeyore. So, with Trafalgar Square as the setting for London’s official bash in celebration of their patron saint, a blast is pretty much guaranteed. This year, a three-day extravaganza is taking place from Friday March 15 to Sunday March 17 and it is set to see more than 125,000 turning out for Irish food, dancing and a giant parade featuring pageantry, floats and music. 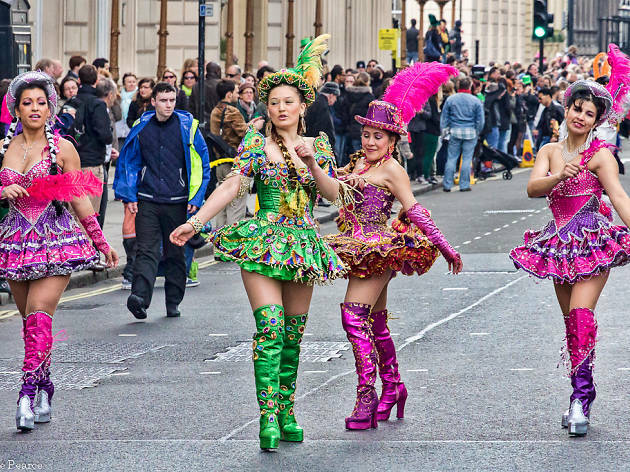 Read our guide to St Patrick’s Day in London. This looks great, hope the weather holds out! I appreciate these free events in London as they are always cheerful, but this year it was quite a struggle to enter Trafalgar Square. So many exits and two different entrances .....which take ages to let us in! Would have been easier it everyone could just walk in. Security tried to give that appearance of keeping you safe but they barely look in your bag( anyone interested in bringing a weapon/ alcohol/drugs could have done so easily ). Overall fun as usual but I hope next year they organise it better . This was a bit of a disappointment to be honest, in theory it seems like a very pleasant idea but in truth it was overcrowded and slightly disorganized. Due to the nature of the day many people were very drunk which left Trafalgar looking disgusting. Aside from this the actual entertainment was average at best. If you haven't been then I would recommend going at least once just to see how it is as it is free, but do not have very high expectations. This parade was very disappointing by most parade standards. It looked more like a rally or march at times, with not much pizazz and just lots of people holding banners and doing quite disorganised dancing. That said, the crowd was friendly and there were some better moments, especially the Texas school big band (what that was doing in the irish parade I don't know, but it was the best part for sure). 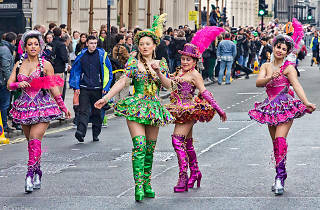 We went down to Trafalgar square for the celebrations and the music was good, again the crowd was fun and lively. That said, Trafalgar Square is really bad at crowd management. The queue for the toilets took an hour, and the queue to get in in the first place took about the same and had no structure so people could queue jump continually. Not well organised but I suppose quite good fun regardless - and of course it's free! It would be really helpful if someone was able to let the Irish Community know who is playing in concert tomorrow at Trafalgar Square. So much for communication or lack of? Craic is a word loaned into Gaelic from English/Scots. It's translation is crack. Lamb and potato Shepard's Pie is in fact just Shepard's Pie, the latter being a dish consisting of lamb and potato the former your failed attempt to gussy up something wholesome in the manner of a menu from a crap pub sorry...bistro microwave. Revels will NOT end before Monday, as Monday IS St. Patrick's Day... we need to buy 2 bunches of shamrock: one for today, one for tomorrow. Lovely shamrock, fresh, green, grown in Ireland at Browning's Flowers in the Stables Market Camden Town - I'd better get there now, while they're still available! Will be a great day full of fun!